This week we had another offering from Stick Insect. You know… the guy who thought he would give JEG a break by giving us a puzzle that nobody could get wrong! That was no 4328 Reductio ad Absurdum). By following the simple messages, all that was required was a blank grid. The theory was excellent, but in practice there were quite a few solvers who got it wrong. The best laid plans… etc. Here we were faced with a large 20×10 grid which lacked symmetry but needed some highlighting and some items to be identified with an appropriate shape drawn through one of them. I had been expecting a Battle of Hastings puzzle for quite a few weeks, and both the title, the grid and the preamble smacked of the Bayeux Tapestry. Not that this knowledge would help me until the grid was complete. Drat! 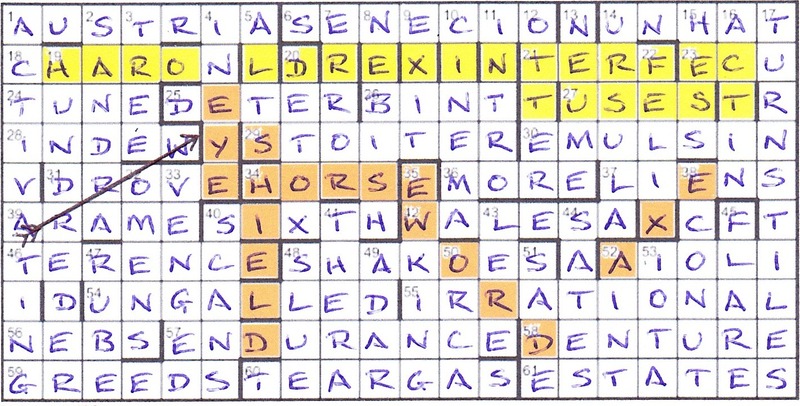 Some clues needed to lose a letter before solving (giving us a hint), while the entries from those remaining contributed one or more letters to the six objects. It sounded like a fun endgame. The clues were fairly generous. Although I only got ten (out of 31) acrosses first time through, the downs yielded nearly twice as many (out of 35). Forty minutes in, and the grid was looking healthy. Mind you, it didn’t help that I had no idea how many clues needed adjustment, but at this point about half my clues had lost a letter. The hint they were to reveal wasn’t obvious. About an hour later, and I was done. It took me some time to resolve 59ac Return to play again on lost steep desires (6) for GREEDS. ‘Steep’ became ‘step’ but I couldn’t work out what bit had to go backwards. It was, of course, DS (dal segno) going after GREE (old word for step). The clue that entertained me most was 17dn Gates ultimately lost team-makers caps (10) for TURNSTILES — T (losT) + URNS (tea-makers) + TILES. The message finally confirmed my Bayeux Tapestry hunch, reading Number of answers followed by number of rows to give 1066. I googled an image of the tapestry. I knew it was long, but was amazed to find that it was nearly 70 metres, although only a puny ½ metre high. The ARROW, an obvious element in the grid, was easy to spot, together with Harold’s EYE in column 6. The SWORD, SHIELD and AXE came next, but it took me the best part of 20 minutes to locate the HORSE, probably because I didn’t think of the poor thing as an ‘object’! The highlighting consisted of the words at the top of the image: HAROLD REX INTERFECTUS EST, “King Harold is slain”. And here we are 950 years later, and still at war with Europe! This entry was posted on 4 November 2016 at 4:00 pm	and is filed under Solving Blogs. Tagged: King's Album, Stick Insect. You can follow any responses to this entry through the RSS 2.0 feed. You can leave a response, or trackback from your own site. What fabulous graphics, Dave (and Tim too – I’m going to have to pull my socks up!